To better understand the contributions of these factors, in our study published recently in the IJE we made a major effort to convert 78 Demographic and Health Surveys into a longitudinal dataset that allowed us to track all key variables at a country regional (typically provincial) level in sub-Saharan Africa over time. The final dataset covered 562,896 child observations across 241 regions in 24 countries for the period 1990–2014 (Figure 1). Our findings indicate that observed child mortality declined from 105 to 77 per 1,000 live births between the first and last surveys, and most key health interventions now have greater coverage (Figure 2). Continued breastfeeding (beyond 6 months) was the only health intervention for which there was a decline in coverage. Substantial increases in coverage were found for bed net ownership, vaccination, access to family planning, antenatal care, intermittent preventive treatment for malaria during pregnancy, and prevention of mother-to-child transmission of HIV. The increases in coverage were relatively modest for maternal education, water, and sanitation. We found that urbanization, access to electricity, and maternal education appeared to have protective effects on child mortality. Only two of the seventeen public health interventions considered — continued breastfeeding and full vaccination coverage — appeared to be associated with reducing child mortality after controlling for socioeconomic factors. 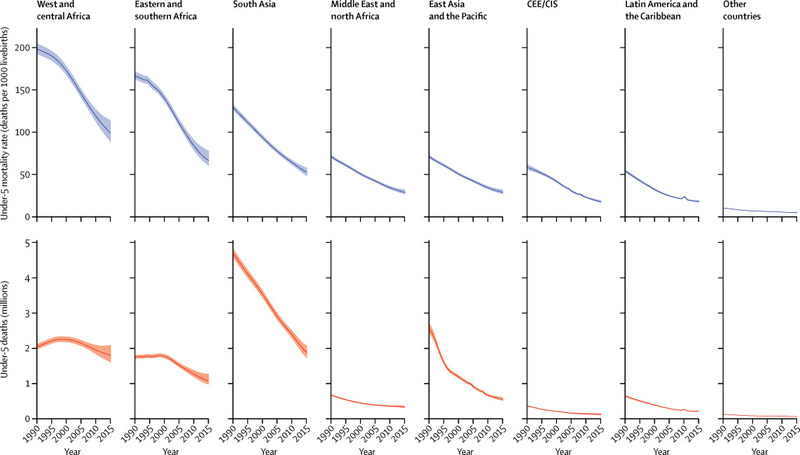 The impact of each intervention on child mortality was greatly heterogeneous within and across countries. It may not come as a great surprise that vaccinations and breastfeeding duration made substantial contributions to reducing child mortality, and the same is true for education and general economic development. More surprising is that we did not find an effect for some interventions for which coverage has changed dramatically and which have been shown to have strong effects on child survival. This may be most striking for bed nets, where coverage has increased tremendously in recent years. One possible reason why bed net coverage was not shown to be effective in our analysis is that coverage increased more uniformly within countries (e.g. via mass distribution campaigns) compared with other interventions requiring greater health service infrastructure. If so, our study design, which relied on within-country variation over time, would not detect any positive effect of bed nets due to the country and survey fixed effects. It is also possible that reported bed net ownership is a poor indicator of whether children consistently sleep under the nets. Overall, our findings likely underestimate the true impact that recent global health efforts have had on child survival. But even taking the numbers at face value, the overall effectiveness of those efforts can hardly be questioned. The current estimate of child mortality for sub-Saharan Africa is about three million deaths per year. More than six million children would likely die if the under-5 mortality rate had not changed since 1990. Of those extra three million child deaths we would have seen per year, we can directly attribute 50% of the improvement to key interventions at the regional level, thus corresponding to about 1.5 million child deaths prevented per year. Development assistance for health has been growing, with donors disbursing $36.4 billion to improve health in low- and middle-income countries in 2015, a five-fold increase from 1990. Our findings suggest that expanded coverage of public health interventions has made substantial contributions to the mortality declines seen in sub-Saharan Africa over the past 25 years. While all socioeconomic variables considered appear to strongly predict health outcomes, this was true for very few health coverage indicators. These weak results may reflect a certain amount of measurement error but could also be interpreted as evidence of limited effectiveness of some interventions at scale. Further research should aim to more closely identify whether sufficient investments have been made to support effective interventions and why specific interventions may or may not work in certain settings. Akachi Y, Steenland M, Fink G. Associations between key intervention coverage and child mortality: an analysis of 241 sub-national regions of sub-Saharan Africa. International Journal of Epidemiology, dyx262, https://doi.org/10.1093/ije/dyx262. Yoko Akachi is a global health consultant based in Helsinki, Finland. She currently works on reproductive health program impact evaluation and social health protection. Maria Steenland is a doctoral candidate at Harvard T. H. Chan School of Public Health in the Department of Global Health and Population. She studies the effectiveness of interventions to improve health care coverage and quality. Günther Fink is Associate Professor at the University of Basel and Head of the Household Economics and Health Systems Research Unit at the Swiss Tropical and Public Health Institute in Basel, Switzerland. Next Next post: Can we promote physical activity at the population level?